iPharmacy app for iPhone is a Drug and Medication guide which stands as one of the top iPhone applications in the paid category. iPharmacy app is brain child of Sigma Phone LLC and is considered an extra ordinary medical application. It is handy medication guide, drug reference or drug guide. iPharmacy iPhone app is built as a digital drug identifier which recognizes 80,000 packages and distinguish drugs of the same name. More than 20,000 commonly prescribed drugs. All drug information is from relevant FDA. There is a well formatted and easy to read non PDF section which contains indications and usage, dosage and administration, contraindications, warnings and precautions, adverse reactions, drug interactions, over dosage and how they are supplied. Easy navigation throughout the application. 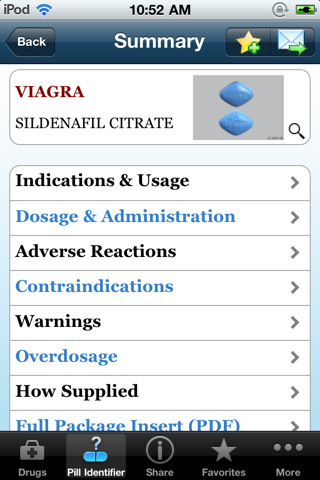 In iPhone iPharmacy app,drugs are listed and are searched by trade names and ingredients. It offers value to users through various savings. As they are partnered with Honest Discounts, app users enjoy the facility to cash on big savings on their prescription. There is a pre-activated prescription discount card on iPharmacy iPhone and Android app where users can save up to 75% off the original price on their prescription. It is accepted at over 54,000 pharmacies and the user need to just display the discount card in the app to the pharmacist at any of the participating pharmacies. The app allows the user to save a list of commonly used drugs and medications and to share the information via email etc. You can enter the National Drug Code to look details up directly. It is useful for consumers and an essential tool for healthcare professionals. A PDF file can be viewed with all package insert details. iPharmacy app for iPhone is typical tool as all the information are readily accessible from within the application where it offers information on thousands of different drugs right at the touch of a button. It is an extraordinary useful application if you or your loved ones have to take a lot of medication and you want to learn about them quickly. With these countless features and advantages iPharmacy app of iPhone gained a lot of media attention and is considered the best application for prescription reference.